December 17, 2015 / Geneva, Switzerland / McKay Brothers International’s (MBI) Central London POP, adjacent to the London Stock Exchange, is now live. The Central London POP completes MBI’s UK Local millimeter wave network. MBI connects data centers serving major UK equities, interest rate and FX matching engines at the lowest known latency. For example, latency from Slough-LD4 to a MBI’s Central London POP is 272 microseconds round trip. 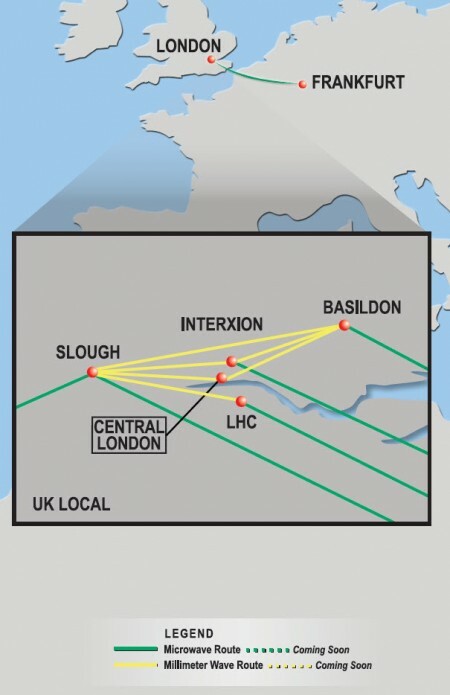 Slough-LD4 to Interxion’s Central London location is covered in 280 microseconds round trip. 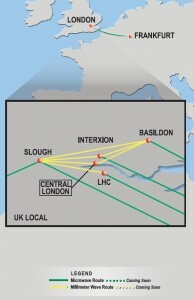 MBI’s private bandwidth service connects clients trading at key FX matching engines in Slough-LD4 and the London Hosting Center. MBI’s latency between those data centers is 306 microseconds round trip, the lowest known. MBI offers four long haul microwave routes between major UK trading co-los and Frankfurt-FR2. Each long haul link is the lowest known commercial latency. MBI’s QED service offers exchange-sourced market data from Illinois, the UK and Frankfurt in all its European POPs.